I haven’t adjusted well to the whole going back to work thing. In fact, I’m starting to think my future holds a man with lots of money and me staying home all day, cooking him a healthy vegan meals, scrapbooking and watching my stories. Except, my stories would be more like re-runs of Veronica Mars and Gilmore Girls and not traditional soap operas. This morning, I not only managed to sleep through my alarm clock, but I somehow also managed to reset my clock forward 15 minutes. So when I woke at 7:15, aka the exact time I’m suppose to leave the house, I had a huge freak out. At some point as I flung on whatever clothes where closest to me, I was able to calm down a bit because I realized I had 15 whole minutes instead of 0. But still, I have zero recollection of resetting my clock! A little tip: Save all your glass jars from sauces, nut butters or jams and reuse them for storage. My ground flax seed is in an old tomato sauce jar and my spices are stored in tiny mason jars! You reuse, it helps with storage situations and it keeps nasty moths and bugs out of your items. Yeah! I also managed to 1. forget my badge for work so I had to run back and get it, 2. wait 15 minutes in my driveway as my next door neighbor’s painter moved his van, 3. get stuck behind the recycling truck, 4. get stuck behind a school bus and 5. forget my much-needed, happily-caffinated tea at home. Preheat oven to 350F and line a 12 cup muffin pan with muffin liners. Place wet ingredients and mix with a mixer or beaters. Place all dry ingredients in a large bowl and combine. Pour wet into dry and mix. It will be runny, but don’t worry! 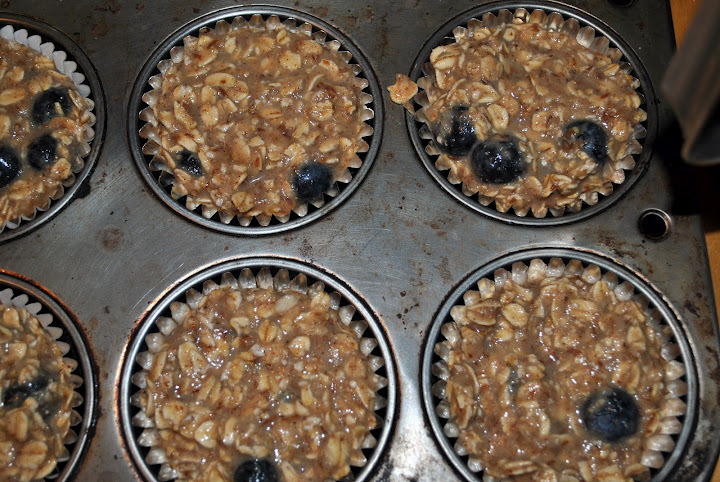 Pour mixture into muffin cups and top with desired toppings. The don’t rise so you can fill the liners almost to the top. Place in prepared oven and bake for 25-30 minutes or until toothpick inserted comes out clean. Mine were done at 26 minutes. 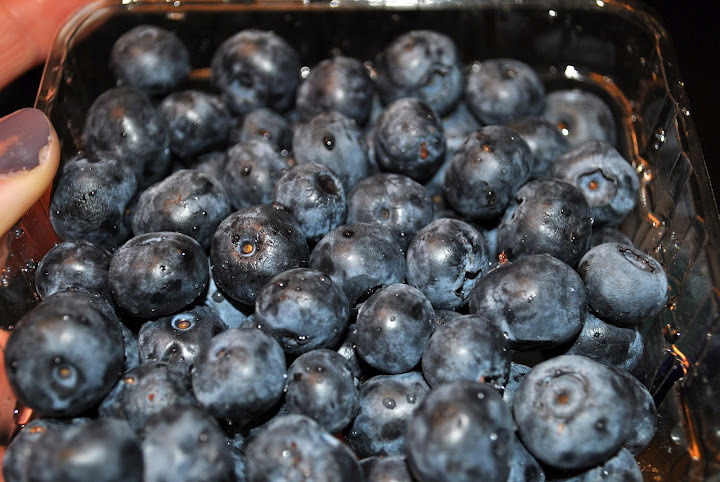 Allow to cool in the pan for 2-3 minutes before removing onto a cooling rack. Microwave before serving for 30 to 45 seconds to get a hot oatmeal flavor. I served mine over half a carton of vegan vanilla yogurt to make it a little more heartier. 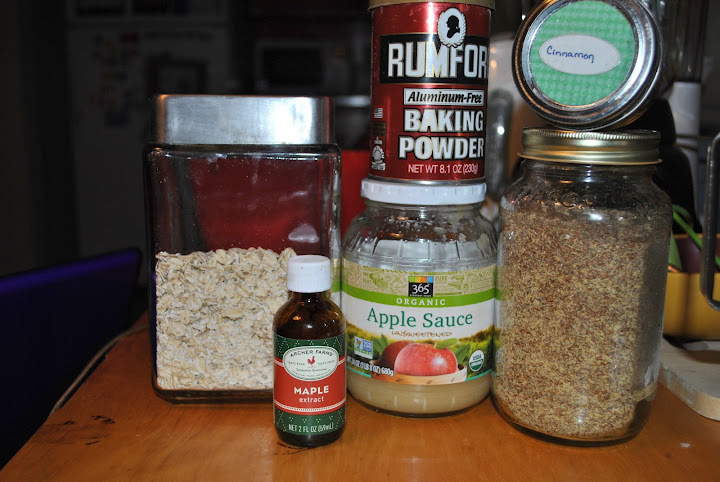 When I made these, I was sort of expecting a cake like consistency but they really do taste like oatmeal! 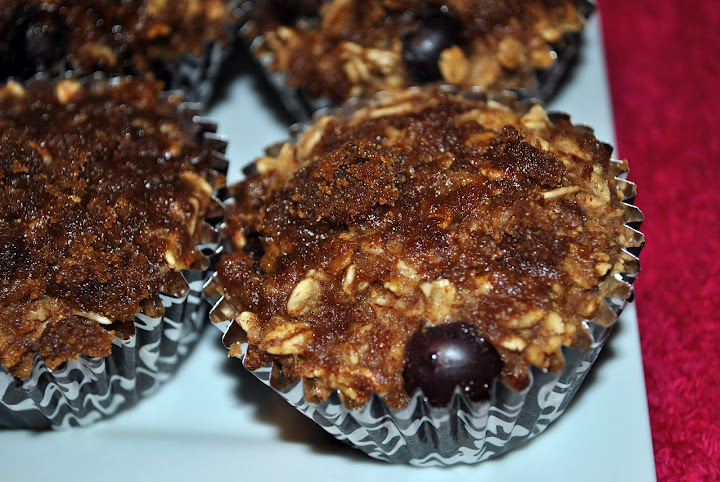 The applesauce and the banana make them super moist and give it that oatmeal consistency. I’m definitely a fan! 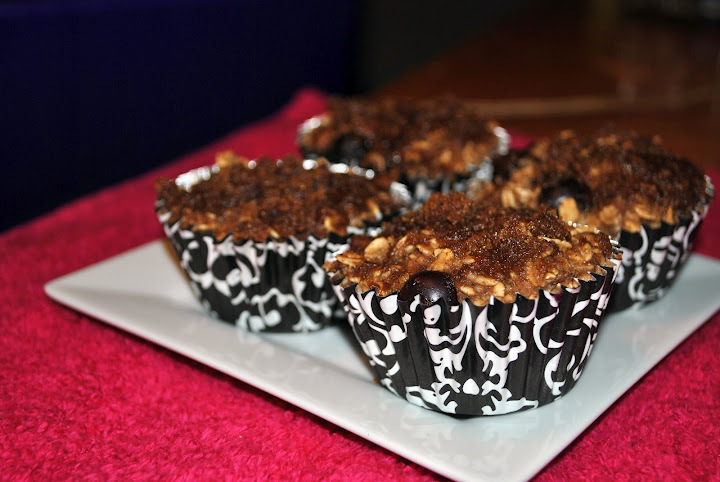 Plus, without the streusal topping, Leanne at Healthful Pursuit said these were only 102 calories! Not too shabby. I haven’t tried any of those yet so I can’t vouch for their yumminess but the overall, the oatmeal cups are great so I imagine any toppings you like will be a great addition. Note: Leanne didn’t add blueberries to her oatmeal so those toppings were all added to a plain oatmeal cup. Now, let’s see if I can actually eat my breakfast without dropping it on my lap or down the front of my shirt. I don’t have high hopes but I’m keeping my fingers crossed.